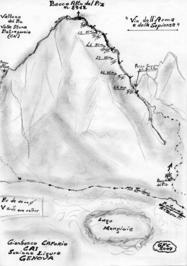 Completed on 18 August 2007 by Giafranco Caforio with the collaboration of Caterina Mordeglia, Giovanni Sotgiu and Raffaele Marongiu, this route, of overall TD- assessment, runs along 5 lengths, with the last 80 m. on terminal ridge wire, for a total development of about 310 m. Rise time: h. 2.30 / 3. From Rif. 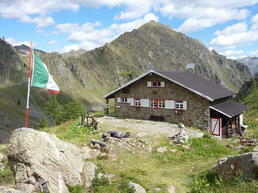 Zanotti, take the path towards Lake Mongioie and Mt Tenibres; at an altitude of about 2400m, follow the arrow indicating the N / E wall of the Piz to the right and continue along the trail marked with red markings until the Soprano della Scolettas pass (2755m, approx. Equipped in modern style with 10 mm bolts. and parking chains. We recommend a normal mountaineering equipment. From the summit cross, follow the normal road, marked with red marking, up to Passo del Vallone and from here follow the red arrow heading south that leads back to the Upper Vallone del Piz and Pian della Regina.